Click/tap here to learn more about the symbolism of the 17th-century head-piece to the left (at the start of this Web page’s text column) = a Gnostic emblem, symbolizing the search for truth, popular with English printers from 1583 through 1693. See our She-philosopher.​com website design page (“The New She-philosopher.​com: A Note on Site Design”) for additional discussion of our digital design philosophy & strategies. Phil Agre’s home page and Red Rock Eater (RRE) News Service page are no longer active, but the sites are maintained by his former employer, the University of California at Los Angeles. For more about Phil and his influence on Internet communications, see his Wikipedia page. The listserv is an older technology I was sorry to see displaced by new Web-based social media. For more re. the challenges posed to university presses by the “emerging Wild West in academic publishing,” see Scott Sherman’s “University Presses Under Fire: Incrementalists and Futurists Battle over the Mission of the University Press” (The Nation, vol. 298, no. 21, 26 May 2014, pp. 19–24). There is more on Robert Burton and his Anatomy of Melancholy in the She-philosopher.​com GALLERY and LIBRARY. The two IN BRIEF topics on developing the human capacity for excellence and good — in individuals and societies — through the practice of such Aristotelian virtues as prudentia and phronesis feature more symbolic representations of past-present-future mindfulness. “By the double Head of Janus, so famous among the Romans, some imagine that Prudence and Popularity were represented.” (Dennis de Coetlogon, An Universal History of Arts and Sciences, 1745, 160) As such, the double (bicipit) headed Janus was sometimes pictured as the Tricipit or Trifrons Janus with a triple head, a symbol of the three faces of Prudence (Memoria, Intelligentia, and Prudentia) and the three divisions of time (past, present, and future). For more on the historian’s “dialogic imagination,” as theorized by M. M. Bakhtin, see the IN BRIEF topic introducing core concepts from the work of the Russian literary critic, Mikhail Mikhailovich Bakhtin. For more about Sir Walter Ralegh — whose “view of history as God’s instrument for the moral improvement of man was acclaimed by many of the men of Parliament who were to lead the rebellion against the King” (J. Winton, Sir Walter Ralegh, 289) — see the IN BRIEF biography. There is more about Ripa’s Iconology and the early-modern emblem genre in the Gallery Exhibit on the Athenian Society emblem. Ripa’s figure of History featured prominently in Nicolas Poussin’s design for the frontispiece, engraved by Claude Mellan, for the mid-17th-century French edn. of the bible, Biblia Sacra (Paris, 1642). Poussin’s celebrated design depicts the Neoplatonic notion of a veiled delivery of divine truth and universal law, wherein an impressive veiled figure holding a sphinx represents the mystical understanding of the Scripture. Poussin’s History, writing in a book whose opened page is in the dark, stands under the apparition of God, next to the veiled figure of Prophecy (or Religion). A facsimile of Poussin’s frontispiece for the French Biblia Sacra of 1642 is included with the editor’s introduction to Thomas Tryon’s The Planter’s Speech to his Neighbours & Country-Men of Pennsylvania, East & West-Jersey ... (1684) at the subdomain known as Roses. Having trouble getting some of the underlined text links on this page to work? There are 2 “hover” boxes used on this Web page. There is additional material on Margaret Cavendish, one of She-philosopher.​com’s featured “Players,” located elsewhere at She-philosopher.​com. The best way to find it is to use our customized search tool (search box at the top of the right-hand sidebar on this page), which is updated every time new content is added to the public areas of the website, thus ensuring the most comprehensive and reliable searches of She-philosopher.​com. I study history … because I am interested in the future. That is a most appropriate mission statement for She-philosopher.com, which I have tried to design as an invitational rhetoric to 17th-century historical study. I hope the site will invite mutual inquiry and collaborative scholarship of the sort I came to value on a couple of favorite listservs during the early 2000s. Phil Agre named this phenomenon “Internet-mediated collective cognition,” and described in detail how the Internet can provide a means of “thinking together” and building new communities of practice, each with its own public sphere, language, agenda and traditions (“a shared situation provides the basis for shared thinking, passing information, telling stories, naming feelings, solving problems, and figuring out whether one’s own experiences are strange and unique or, more commonly, not”). Although not without its problems (e.g., restricted and unequal access, or the fact that “an in-group can become even more of an in-group if it wants to”), the Internet can also facilitate pluralism (via our membership in multiple communities) and democracy (via the formation of more lateral than hierarchical connections), even in scholarly endeavors. Now that She-philosopher.com has entered Phase II of its development (beginning with the site’s redesign in 2012 and its relaunch as “the new She-philosopher.com” in July 2016), I continue to embrace what critics have dubbed the “emerging Wild West in academic publishing.” With “the new She-philosopher.com” I have shifted even further away from the traditional print-based format of the peer-reviewed scholarly monograph, preferring a more open-ended and interactive process orientation for the website, in keeping with the changing role of authoritative writing and specialist knowledge in the more fluid learning communities which now flourish on the Web. Why study the 17th century? It remains a valid question, and one which I think deserves to be addressed in this space, as well. As in travelling the rest go forward and look before them, an antiquary alone looks round about him, seeing things past, etc., hath a complete horizon. —Janus Bifrons. The Janus figure to which Burton referred — in Roman mythology, guardian of portals, and patron of beginnings and endings (“god and Patron of times and ages” according to John Bulwer in his Chironomia of 1644), whose temple was never closed except in times of universal peace — was usually pictured with two faces, a “comic monster” that symbolically “represents the perfect man” (E. Wind, Pagan Mysteries in the Renaissance, 202). Today, we often associate two-faced gods with deceitfulness, but in Burton’s day, a Janus-like ability to think multiply about one’s position in time and space (a characteristic of prudential reasoning) gave one a certain advantage when having to adapt rapidly to changing circumstance or manage contingency. I believe it still does. To develop foresight, we need to practice hindsight. Studying the past is always more about the present than anything else. Historical study does not so much recapture “real” persons and events as it does “reflect back to us a set of contemporary concerns.” (S. Jarratt and R. Ong, “Aspasia,” 10) In the case of She-philosopher.com, those concerns have to do with contentious issues of cultural politics, especially regarding gender, science, technology, and modernity. requires us to be aware — as aware as we can be — of our own historical situation and its effects on our perception of the text or past. Analogously to social structures, every age has its own dominant conceptions as well as remnants of past ones and rudiments of those of the future. It is one of the most important tasks in comparative epistemology to find out how conceptions and hazy ideas pass from one thought style to another, how they emerge as spontaneously generated pre-ideas, and how they are preserved as enduring, rigid structures [Gebilde] owing to a kind of harmony of illusions. It is only by such a comparison and investigation of the relevant interrelations that we can begin to understand our own era. Furthermore, whether we like it or not, we can never sever our links with the past, complete with all its errors. It survives in accepted concepts, in the presentation of problems, in the syllabus of formal education, in everyday life, as well as in language and institutions. Concepts are not spontaneously created but are determined by their “ancestors.” That which has occurred in the past is a greater cause of insecurity — rather, it only becomes a cause of insecurity — when our ties with it remain unconscious and unknown. If we want to investigate an earlier thought style, we must examine the original sources, not modern summaries of old viewpoints. With such historical self-consciousness, we become increasingly sensitive to that dialectic of freedoms and constraints (sociopolitical, cultural, natural, and artificial) which defines the human condition, and within which the historian, like everyone else, must work. [women and] men make their own history, but ... they do not make it under circumstances chosen by themselves. Modeling historical study as prudentia is thus one of my guiding principles at the new She-philosopher.com, and shapes my own historical research. An improved understanding of how we live and act and come together within a given dialectic of freedoms and constraints, specific to time and place, is, to me, the most valuable thing that historical study offers. In sum, I am not interested in recapturing the past or in pushing a renewed Renaissance humanism, but in pursuing a refashioned humanism, able to reconcile the universalist dimension of the human enterprise with the diversity of the peoples undertaking that enterprise across time and space. Nay, so ripe and pretending is the present Age, that Women pass their time in the best and solidest Histories. But tho many read, yet all do not read with Judgment and Observation. Therefore they may learn in reading this Book, instructions how to read and write too. It was popularly held that history was an indispensable guide to living fully and well, by offering “such substantial Examples as may be of advantage to improve [human] judgment in Civil Wisdom, and the necessary conduct of Life” (G. Scot, "Epistle to the Reader", The Memoires of Sir James Melvil of Hal-Hill, 1683, a2v). HISTORY has been call’d, by a great Man, Speculum Mundi: The Looking-Glass of the World; It gives the best prospect into Humane Affairs, and makes us familiar with the remotest Regions: by this we safely sit in our Closets, and view the horrid Devastations of Countreys, Tumults, Changes and Ruptures of Common-Wealths; The Reverse of Fortunes, the Religions, Politicks and Governments of Foreign Nations; by this we may consult what practices have Establish’d Kingdoms, what Laws have render’d any particular Nation more Safe, happy and Civiliz’d than its Neighbours; and, what has Contributed to the Weakness and Overthrow of Bodies-Politick, and what has Facilitated its Rise and Settlement; and, in a Prospect of the whole, a New Scheme may be drawn, for future Ages to act by. Wisdom got by Experience is usually very Expensive, Tedious and Uncertain; Several Experiences confirm ones Knowledge, and a Man’s Life is too little to make many in every Case; But if he finds [’em] faithfully done to his hands, the labour is sav’d, and he may grow wise at the expence of other Mens Studies. It was Thales that said of History, Nil Mortem à vita differre; because the Life of the Deceased depends upon the remembrance of the Living. Mr. Brathwait, in his Nursery for Gentry, says; Wou’d you be enabled for Company? no better Medium than Knowledge in History. It wou’d be a dispraise to advance an Elogy upon this Study, which reconciles all times but futurity, renders all the spatious Globe of the Inhabited World common and familiar to a Man that never Travelled: We may see all Asia, Africa and America in England; all the Confederate Countreys in ones Closet; Encompass the World with Drake; make New Discoveries with Columbus; Visit the Grand Seignior in the Seraglio; Converse with Seneca and Cato; Consult with Alexander, Caesar and Pompey: In a word, whatever Humanity has done that’s Noble, Great and Surprizing, either by Action, or Suffering, may, by us, be done over again in the Theory; and if we have Souls capable of Transcribing the bravest Copies, we may meet Instances worth our Emulation. History is, as by some, called the World’s Recorder; and, according to my Lord Montague, we must confess, That no wise Man can be an Experienc’d Statist, that was not frequent in History. Another tells us, That to be acquainted with History, purchases more wisdom than the Strictest Rules of Policy; for that the first do furnish us with Instances as well as Rules, and, as it were, personates the Rule, drawing out more into full proportion: History best suits the Solidest Heads; Whence we find, that Caesar made it his Comment. We read, that King Alphonsus, by Reading Livy, and Ferdinand of Sicily, by Reading Quintus Curtius, recovered their Health, when all the Physical Doses they took prov’d ineffectual; but, whether ’tis Friendly to the Body or not, ’tis not our business to determine: Sure we are, that ’tis Friendly to the Mind, cultivates and informs it in what is very agreeable to its Nature, we mean Knowledge, therein imitating its Divine Original. As there is scarce any kind of Civil Knowledge more necessary or probable than History; (which is therefore very aptly stiled by the Ancients, The Mistress of Life,) so of all sorts of History there is none so useful as that which unlocking the Cabinet, brings forth the Letters, private Instructions, Consultations and Negotiations of Ministers of State; for then we see things in a clear light, stript of all their paints and disguisings, and discover those hidden Springs of Affairs, which give motion to all the vast Machines and stupendious Revolutions of Princes and Kingdoms, that make such a noise on the Theatre of the World, and amaze us with unexpected shiftings of Scenes and daily Vicissitudes. man of impartial Veracity, and firm Resolution to observe inviolable that prime Law of History, Ne quid falsi audeat dicere, ne quid veri non audeat. Not to dare deliver any falshood, nor to conceal any Truth. But all too often, especially in a country riven by years of civil war, history was “stufft up with too great Partiality” (John Streater, “To the Reader,” in Nicolas Culpeper’s Eng. trans. of Jean Riolan’s Encheiridium anatomicum et pathologicum, A Sure Guide; or, the Best and Nearest Way to Physick and Chyrurgery, 3rd edn., 1671, A2r). ’Tis said, Historie instructs the Life, it registers Time, it inthrones Virtue, it proclaims Noble Natures, it crowns Heroick Actions, it divulges Baseness, and hangs up Wickedness; it is a Torch, that gives light to dark Ignorance; it is a Monument to the Dead, and a Fame to the Meritorious. As for an History, said she [i.e., the She-Anchoret], it cannot be exactly true, because there are so many severall intentions interwoven with several accidents, and severall actions divided into so many severall parties and several places, and so many severall Reporters of severall opinions, Partialities[,] Understandings, Judgments, and Memorialls, which gives such various relations of one, and the same action, as an Historian being but one man, cannot possibly know the truth, which makes them write so falsely, whereby Right is so injured and degraded of that Honour which is due unto its merit, or els hath that Honour given, as it had not merited to deserve; Neither doth History add a good to an humane life, or Peace to a disordered State or zeal to a pious soul; for it instructs the present life with the Vices, Follies and Ambitions, Rapines, Cruelties, Craft, Subtilties and Factions of former ages, which make the present age more bold to do the like; and desirous to follow their forefathers steps, which rather inflames the distempers than gives Peace to a Commonwealth; indeed it distempers a peaceable Commonwealth; and ofttimes brings it to ruin, over-heating the youth and hardning the aged; neither doth it add zeal, for reading in history the severall Religions, and many Gods, that wise-men held and prayed to in every age, weakens their faith with doubt of the right, not knowing what to [choose]. Also Historians are for the most part detractors, for they oftner blur mens reputations, than glorify them; and the world is apt to believe the worst part: for one pen may blur a reputation, but one pen will hardly glorify a reputation, for glory requireth many pens many witnesses, or els the world will not believe it, when one accusing pen shall serve to condemne the most noble persons, and Heroick Actions, so unjust the world is. Also Historians are various, writing according to their opinions, judgment, and belief, not often to the Truth; for some praise those men, and actions that others dispraise; causing doubts to the Readers, not knowing which to believe: Besides, they are too partial to sides, and factions, that to the adverse they note things to their disadvantage, or aggravate their errors, or imperfections, and leave out somethings that are of high worth, and worthy the remembrance, or els lessen them in their relations, and to those they adhere to; they do the contrary, they either obscure, or excuse their errors, imperfections and crimes; And they illustrate with false lights their dimme vertues, or give them such praises they never deserved; Wherefore no History should be esteemed but what was written by the Authors [i.e., the subjects] themselves, as such as write their own History of their lives, actions and fortunes, and the severall accidents that befell in their time; and to their knowledge, yet said she, I wish I might outlive the Historian of these times, that I might write a History of the Historians, there to describe their birth and breeding, their life, their actions, their fortunes, their interest; And let the world judge, whether they writ truth; and without partiallity. is that Cavendish herself was a patron of the journalist and poet, Sir John Birkenhead (1617–1679), editor of the arch-royalist Mercurius Aulicus. Mercurius Aulicus, the weekly ‘intelligencer’ of the king’s party, and England’s first official newsbook, ran from January 1643 to September 1645, with only a few interruptions — 118 numbers in all, some 1700 closely printed pages. For the first few issues Birkenhead assisted the principal author, Peter Heylin, whose style was comparatively tame. However, from mid-1643 onward rival newsbooks recognized Birkenhead as the person responsible for the lively amalgam of factual information, witty invective, brilliant satire, and all the modern weapons in a relentless war of words: the ‘inside’ story, the embarrassing quotation, the ‘planted’ idea, the not-quite denied rumour. The various rebel factions were forced to respond with newsbooks of their own, two dozen of them, the most important being Mercurius Britanicus (1643–6), whose misspelt title Aulicus did not fail to deride. None, however, was able to rival Birkenhead in facile style, wit, vitriol, or even the presentation of accurate news; after all, he had the best ‘sources’, the king’s entire bureaucracy and spy network. As an historian, Cavendish chose to ignore developing trends in history writing (as modeled, e.g., by Sir Walter Ralegh and Francis Bacon), offering her own taxonomy of the genre, which cast the ideal historian as moral judge and encomiast. Many Learned Men, I know, have published Rules and Directions concerning the Method and Style of Histories, and do with great noise, to little purpose, make loud exclamations against those Historians, that keeping close to the Truth of their Narrations, cannot think it necessary to follow slavishly such Instructions; and there is some Men of good Understandings, as I have heard, that applaud very much several Histories, merely for their Elegant Style, and well-observ’d Method; setting a high value upon feigned Orations, mystical Designs, and fancied Policies, which are, at the best, but pleasant Romances. Others approve, in the Relations of Wars, and of Military Actions, such tedious Descriptions, that the Reader, tired with them, will imagine that there was more time spent in Assaulting, Defending, and taking of a Fort, or a petty Garison, then Alexander did employ in conquering the greatest part of the World: which proves, That such historians regard more their own Eloquence, Wit and Industry, and the knowledg they believe to have of the Actions of War, and of all manner of Governments, than of the truth of the History, which is the main thing, and wherein consists the hardest task, very few Historians knowing the Transactions they write of, and much less the Counsels, and secret Designs of many different Parties, which they confidently mention. Although there be many sorts of Histories, yet these three are the chiefest: 1. a General History. 2. A Natural History. 3. A Particular History. Which three sorts may, not unfitly, be compared to the three sorts of Governments, Democracy, Aristocracy, and Monarchy. The first is the History of the known parts and people of the World; The second is the History of a particular Nation, Kingdom or Commonwealth. The third is the History of the life and actions of some particular Person. The first is profitable for Travellers, Navigators and Merchants; the second is pernicious, by reason it teaches subtil Policies, begets Factions, not onely between particular Families and Persons, but also between whole Nations, and great Princes, rubbing old sores, and renewing old Quarrels, that would otherwise have been forgotten. The last is the most secure; because it goes not out of its own Circle, but turns on its own Axis, and for the most part, keeps within the Circumference of Truth. The first is Mechanical, the second Political, and the third Heroical. The first should onely be written by Travellers, and Navigators; The second by Statesmen; The third by the Prime Actors, or the Spectators of those Affairs and Actions of which they write, as Caesars Commentaries are, which no Pen but of such an Author, who was also Actor in the particular Occurrences, private Intrigues, secret Counsels, close Designs, and rare Exploits of War he relates, could ever have brought to so high Perfection. Today, Cavendish’s “Third sort” of history is out of favor, and we draw a divide between the biographer and the encomiast. Students of the early-modern period such as Patrick Curry urge 21st-century historians to become “historically self-conscious and self-critical” — aware of how our own inherited concepts and values lead us into “either blaming or praising, as distinct from understanding, your historical subjects” (P. Curry, “Astrology in Early Modern England,” 288 and 289). Once again, our focus has shifted. Historical study is less concerned with inculcating virtuous character, and more concerned with thinking about the future in terms of the past. The long ascendancy of the universal may be coming to an end. Assumptions that had seemed secure and unquestionable are all of a sudden doubtful again. As this happens, many are the possible trajectories on offer, and most are backed by their own zealous adherents. There are not many guides to help us choose the best. It is in our interest to make use of past experience as one tool. We should look again at the variety of convictions that our ancestors held, the arguments they advanced, the actions they took, and the results they experienced. To be sure, history cannot tell us exactly what to do, or what choices to make. The responsibility for those decisions will be ours alone. But the time to take the decisions is surely coming. History can help us prepare for it. ^ History. 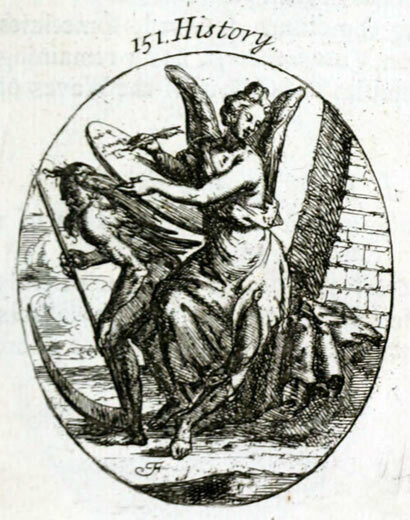 Emblem 151 in Pierce Tempest’s English edition of Cesare Ripa’s Iconology, entitled Iconologia: or, Moral Emblems, by Caesar Ripa (London, 1709). This Web page was last modified on: 02/21/2019 1:43 AM.